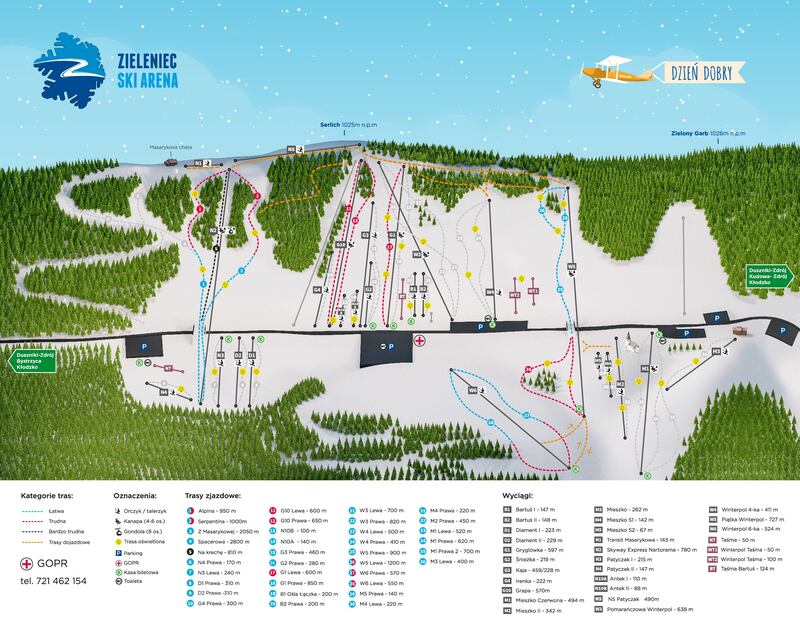 Once we gain the basic skills of skiing on either one or two boards, we are ready to shift from slope to slope and we are not afraid of any one of them, Zieleniec Ski Arena may turn out to be a true skiing paradise for us. 29 ski lifts, 32 diverse routes, with a total length of approximately 32 kilometres, ski schools and ski equipment rentals-these factors make Zieleniec one of the best ski stations in Poland. The most important factor however which stands behind the attractiveness of the resort in the eyes of the advanced skiers are its diversified routes. Those harder ones are normally located in the higher parts of Zieleniec and three routes marked with a red colour (24, 25 and 26) are also located in its lower parts. There is also a black route with the highest level of difficulty which may be found in Zieleniec. “Na krechę”, as that is its name, is located in Nartorama resort-its length is 810 meters and it is definitely the most demanding part of all available routes in Zieleniec. Amongst the 29 ski lifts at the disposal of skiers, there are also 5 modern couch lifts, including one couch-gondola lift (at Nortorama resort). During the ski season, they are open from 9:00 to 22:00- the majority of ski slopes in Zieleniec has artificial illumination systems. And it is the night rides that are one of the most important attractions during the ski season-the possibility of night skiing, quite often in the moonlight and accompanied by heavy frost is something worth recommending indeed.